Following the success of STREETLIGHTS AND SHADOWS (2007) and LETTING IN AIR (2009), Becky Prestwich makes a welcome return to the stage with CHIP SHOP CHIPS, a funny and nostalgic tale of love over fish and chips. Commissioned by Box of Tricks Theatre Company, CHIP SHOP CHIPS is a play about love, family, nostalgia and nation’s favourite food. The play made its premiere at The Hub in Salford in 2016 (check out what we thought of it here) and is now set to tour the country later this month. Becky has certainly had her fair share of success as a writer over the past 10 years. 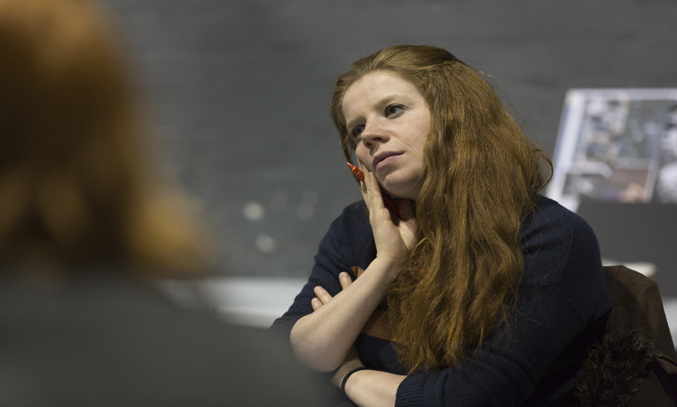 Alongside her stage work, the accomplished North West playwright also writes for radio and TV. Her first radio play CHOPPING ONIONS was broadcast on BBC Radio 4 in 2013 starring Maureen Lipmann and her second, ALIYAH was broadcast last year starring Gillian Bevan. Becky is currently writing for BBC One’s continuing drama DOCTORS, but admits theatre has always remained her first love. In CHIP SHOP CHIPS, the action takes place at the grand reopening of Booth’s Fish and Chip Shop. Prodigal son Eric has returned home after forty years to run the family business following his father’s death. On the opening night, his childhood sweetheart Christine turns up, hoping to reignite old flames. Meanwhile, a romance also sparks up between teenagers Lee and Jasmine. Can nostalgia and a portion of fish and chips bring the lovers together or is history sure to repeat itself? In anticipation for its premiere next month, Frankly My Dear UK caught up with writer Becky Prestwich to find out about the new play and what inspired her to write about the nation’s favourite food – fish and chips! Described as a dinner, dance and a show all rolled into one, the immersive love story asks the audience to put on their dancing shoes and take part in a “unique theatrical experience”. The ticket price even includes a fish and chips supper, served up by the talented four-strong cast. “I knew quite early that I wanted the audience to be eating fish and chips while they were sat down watching the story” explains Becky. The play, which runs from 23 February to 21 April is performing in some unusual spaces across the country, from community centres and libraries to village halls and museums. The idea is to engage with new audiences in their own spaces by encouraging people to who wouldn’t usually visit the theatre to go out and see a different kind of performance, right on their doorstep. “I think it’s really brilliant that it’s on people’s doorsteps and engaging people in spaces that they recognise” says Becky. Working in such different spaces brings its own set of challenges which is why award-winning designer Katie Scott (Liverpool Everyman & Playhouse Studio Design Prize) was brought on board, working closely with Becky and the Box of Tricks team to deliver a space that can be transported from location to location. “The practicalities will be quite challenging I think but hopefully if the characters are clear and the relationship are there, that will stay true wherever it’s happening” explains Becky. With an immersive play such as this, the actors are certainly key to its success and for the first time in her career, Becky was actively involved in the casting process. The small but talented cast includes Josh Moran (GUNPOWDER, PETER KAY’S CAR SHARE), Julie Edwards (BRIEF ENCOUNTERS), Jessica Forrest (HOLLYOAKS, CORONATION STREET) and Mark Newsome (EARLY DOORS). CHIP SHOP CHIPS is produced by local theatre company Box of Tricks, the company who produced Becky’s first full length play, STREETLIGHTS AND SHADOWS at the White Bear Theatre in 2007. Joint Artistic Director and co-founder Adam Quayle (PLASTIC FIGURINES) is to direct the production and has been actively involved in the development of the play. Adam and the Box of Tricks team were so impressed by the play that they chose it to open their 10th anniversary year, putting extra pressure on the playwright to make it extra special. Nerves aside, Becky is honoured to be working with the Box of Tricks team again, particularly Joint Artistic Director and co-founder Adam Quayle who is directing the CHIP SHOP CHIPS. “It’s nice because Adam directed the first play that I wrote in 2007 when Box of Tricks were a very new company” comments Becky. Becky has certainly grown over the past 10 years of being a writer. In 2011, Becky spent a year on attachment to the BBC through the Writersroom 10 Scheme followed by their 2013 Playwrights’ Scheme. 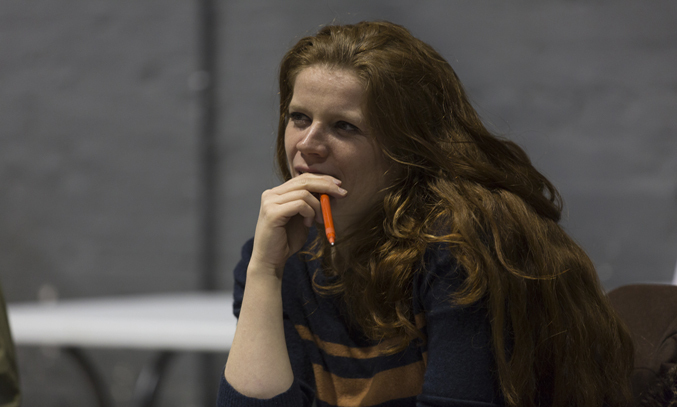 She recently took part in UPRISING, a writer’s attachment scheme with Monkeywood Theatre Company and was one of the writers on SANCTUARY FROM THE TRENCHES, an immersive theatre experience at Dunham Massey (National Trust). Becky is currently writing on DOCTORS (BBC1) having successfully completed a shadow scheme at the end of 2014. “I’m writing a new episode of DOCTORS at the moment which is always nice because you get to carry your own story within the show. But I do love doing theatre. Theatre is kind of my first love of writing” says Becky. “I feel in a very lucky position to be able to choose what best suits the story. The new theatre play I’m working on is about mental health. It’s another love story about a young girl who is recovering from anorexia and a lad who also suffers with mental health problems. It’s a love story between them and that kind of feels like it should definitely be theatre because in theatre, you can get inside their heads in a different way. They talk to the audience and both tell different versions of the same story. You don’t quite know who to believe or not and that feels to me, uniquely theatrical. If I tried to tell that story on TV, it would lose something”. Becky, from Withington in South Manchester, is certainly showing no signs of slowing down. CHIP SHOP CHIPS opens at Dukes Theatre, Lancaster on 23 February before heading out on tour until 21 April 2018. Visit Box of Tricks for the full tour list and to book tickets.